Today was our first morning waking up at EcoCamp, and it takes us only one step outside of our dome to be completely in awe of the view. 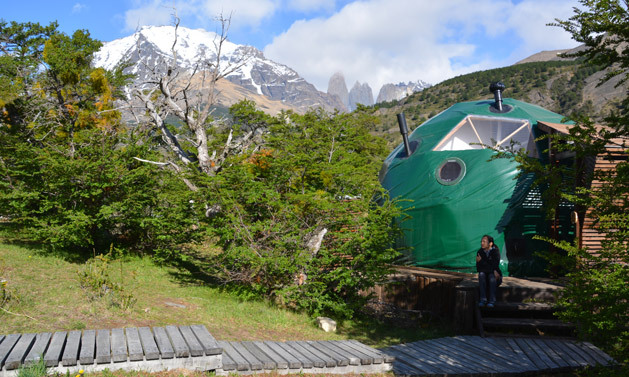 EcoCamp is built on top of a small ridge, making it a natural viewing platform for Torres del Paine National Park and its famous towers, and it truly is the best view I’ve ever woken up to in my life. 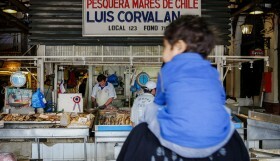 We have two big days coming up in a row here in Patagonia. 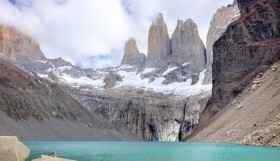 Today we will be heading north with some local guides to try and track down some of Patagonia’s wild horses and tomorrow we will be making the big trek to the base of the famous Towers of Torres del Paine National Park. We are feeling a bit nervous since neither of us can classify ourselves as expert hikers, but we did spend the Summer training on hiking in various State and National Parks across the United States. You can read about our trip to Mt Rainer near Seattle on Anne’s blog. 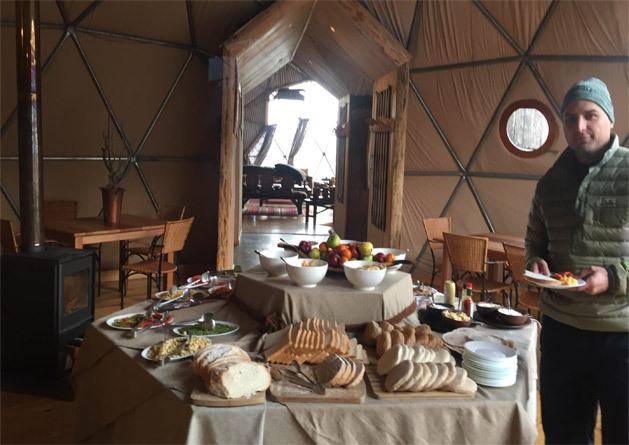 Our trek is the first to leave camp this morning, so we find ourselves as two of the first guests to arrive for breakfast in the community dome. 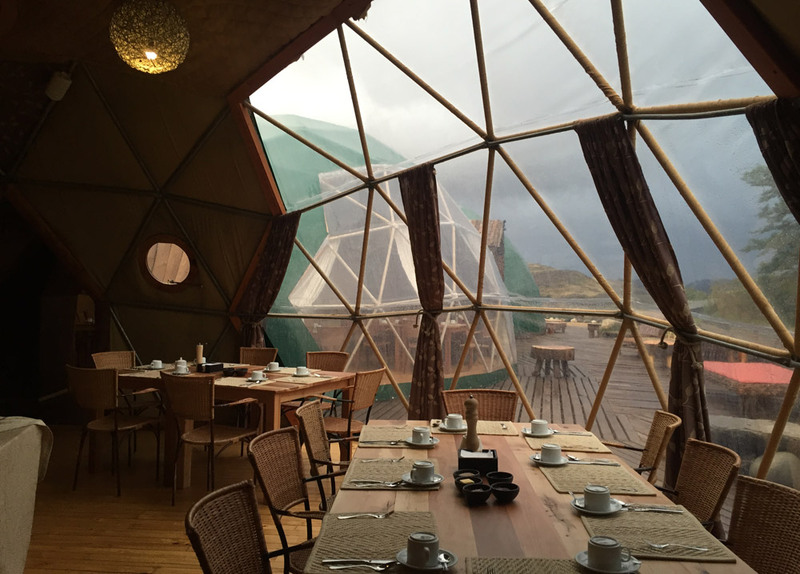 The view from inside the domes is just as spectacular, and the abrupt silence caused from suddenly being out of the wind creates a surreal atmosphere to eat in. The breakfast is nearly as impressive as the dinner we had last night, and we’re trying to pack in as many calories as we can in order to have the abundance of energy we’ll need for our long trek today. After breakfast, we head into another dome where there is a lunch spread set out for us to pack a lunch and snacks for the day. A large variety of fresh-baked bread, lunch meats, fresh veggies, dried fruits, and granola make the choice of what to pack surprisingly hard since it all looks so good. We finally make our choices, add our lunch bags to our daypacks and we’re finally off on our trek. 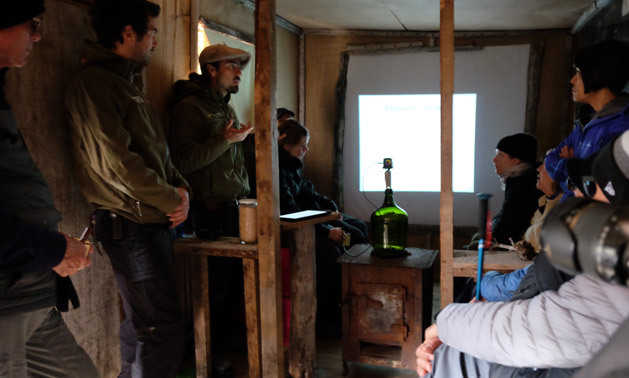 Prior to heading out into the wilderness, our group gathers in a small shed on the outskirts of the national park. 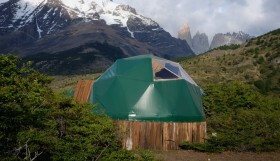 I quickly find out that this building is actually called a “puesto” and is where Patagonian “gauchos” would take refuge while caring for their livestock. This puesto now serves as the headquarters for the researchers who have been studying these wild horses for the past decade. 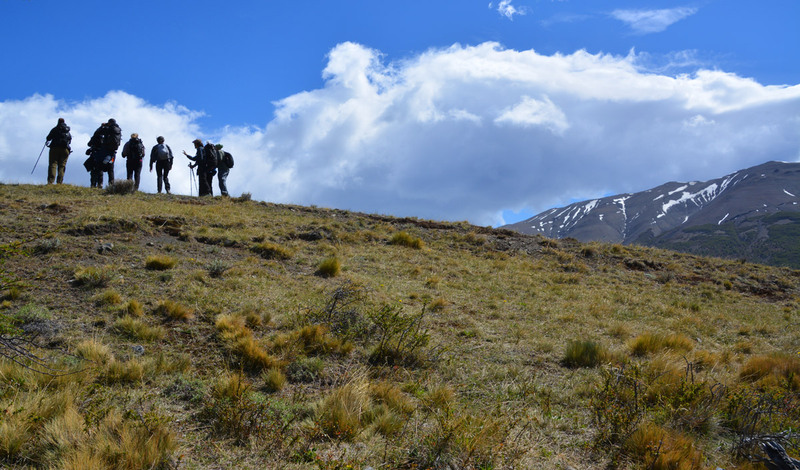 They take tourists like us along with them on these horse-spotting treks in order to help fund their research. It is a pretty unique concept, and it is clearly working as even though we’re here during fringe season, today’s trek is completely full with ten of us total heading out to try and spot some horses. My general knowledge of wildlife is pretty basic, and knowledge of wild horses in particular is no exception. Prior to this trek, the most I knew about wild horses is that in the U.S. we have a car named after North America’s wild horses. Five minutes into our presentation here and I come to find out that even that is technically wrong, as a mustang isn’t even a “wild” horse, it’s a “feral” horse. 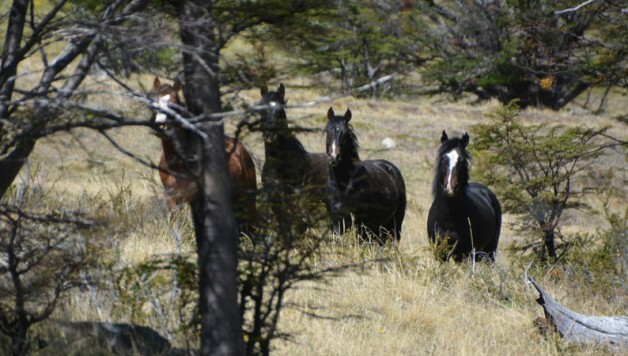 In fact, the horses down here in Patagonia are also feral horses, not wild horses. Meaning they are descendants of horses that were once domesticated but have once again become wild and roam free. 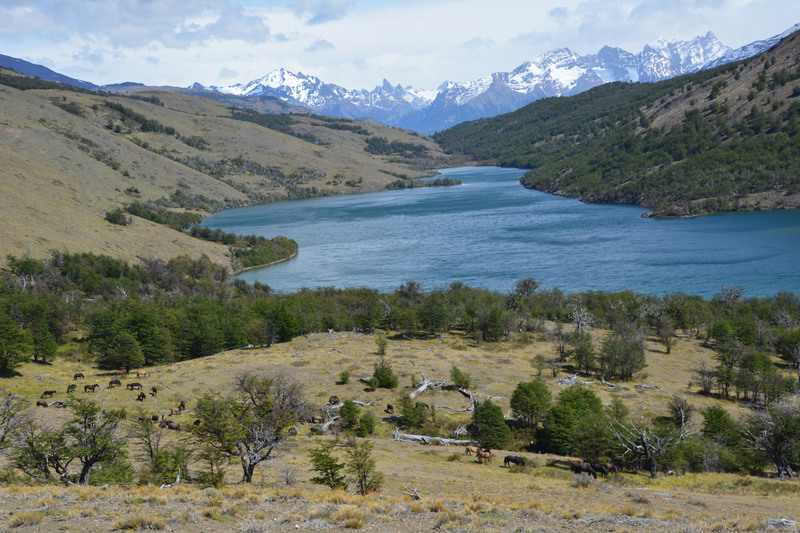 Regardless, the term “wild horse” is still used as an umbrella term to describe feral horses all over the world, and includes the Mustangs of North America, the Brumbies of Australia, and here in Patagonia, the Baguales. 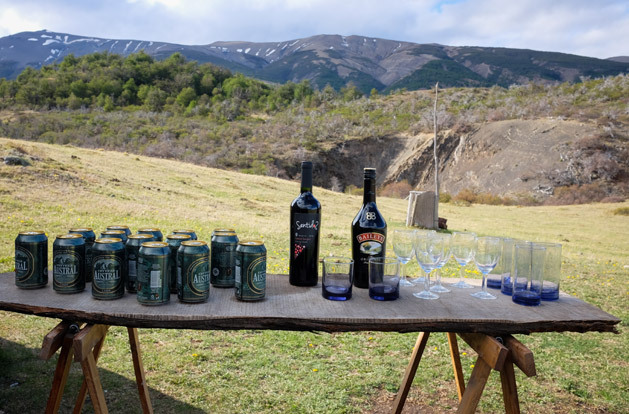 The researcher’s presentation gives us a good background on how these horses were first brought to Patagonia as domesticated animals by Spanish conquistadors in the 16th century. 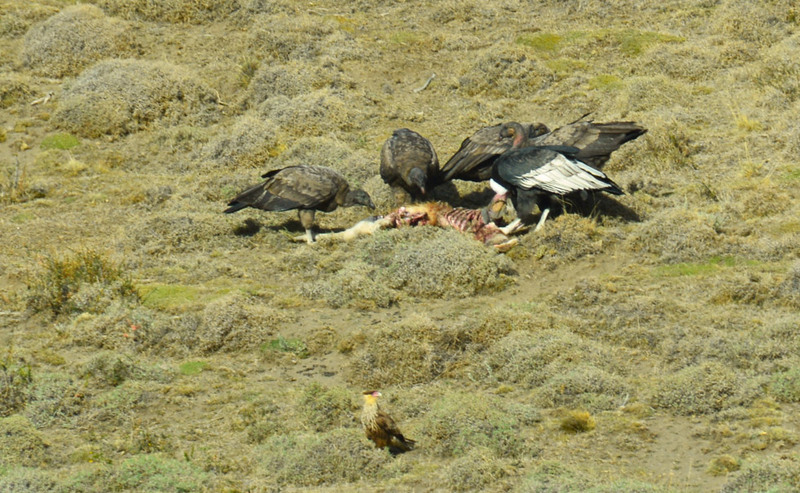 There are now about 100 or so Baguales here in Patagonia and the herd size remains flat nearly every year thanks to the pumas who roam nearby and do their best to help the horses with some natural selection every couple of months. The presentation is just the right length for us to learn some really interesting facts and to have enough time to finish our Baileys with coffee that were served when we got here. After the presentation, we gear up and head out on our trek to see if we can find the horses out in the wild. 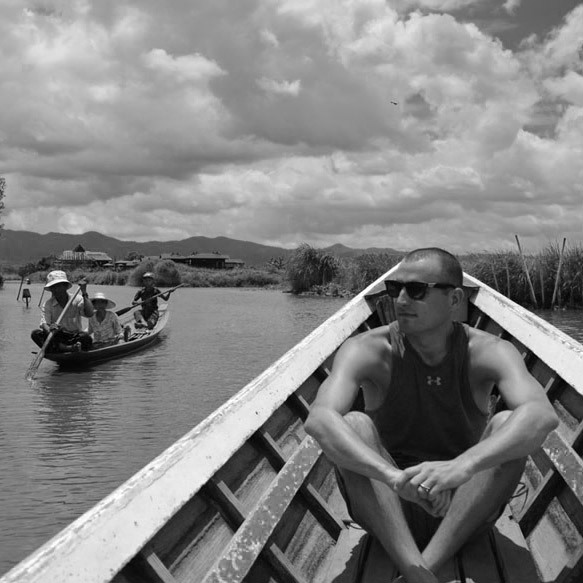 What makes this trek unique from others that I’ve been on is the feeling of participating in scientific research. Sure, we’re not out here curing cancer, but for people like me who have no scientific background or skills, it feels exciting to participate in something like this. Today, the researchers are looking to find the herd of horses and to observe their behaviors. Seems easy enough! However, an hour into the trek, we find ourselves taking our first break, and we haven’t yet seen a horse. 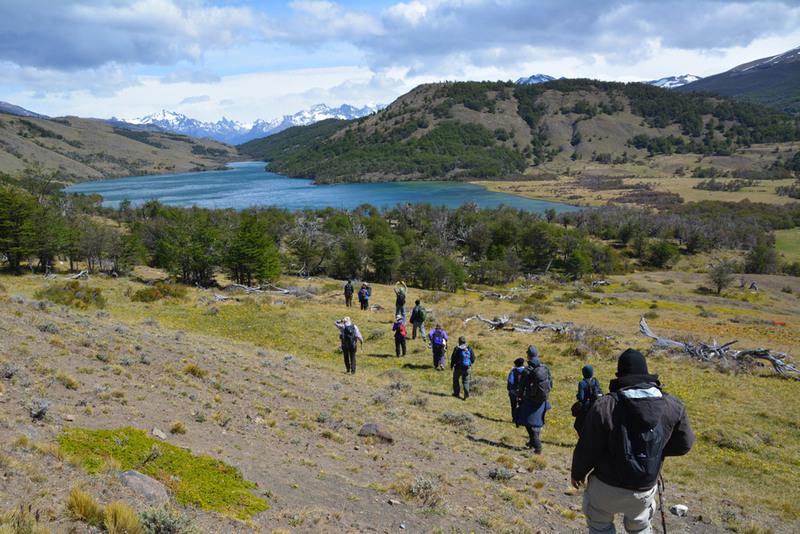 But this is Patagonia, and wildlife is always near by. 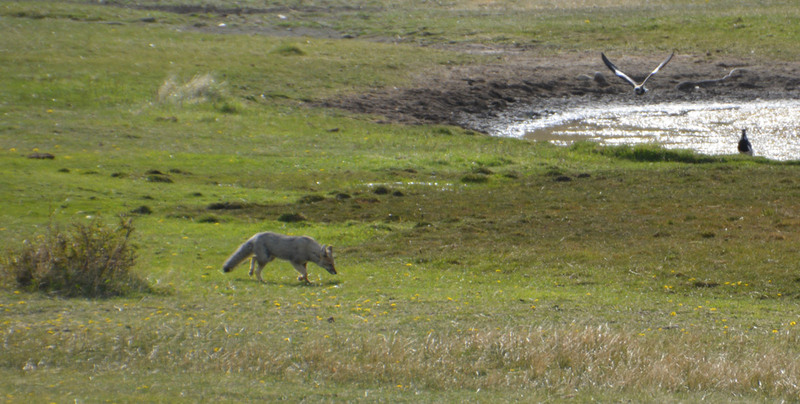 Instead of seeing any horses, we’ve spotted a gray fox as well as some condors feasting on some prey. They are even bigger than I ever imagined. What was really awesome was seeing them fly away after they finished eating. Since they are so big, it is tough for them to get up into the air, especially after eating a big meal. In order for them to take off, they need to walk to the top of the hill, get a running start, and jump off. They look like hang gliders as they begin their take-offs! Within about 15 minutes of starting back up again, the researcher in the front of our group gives us the signal to stop. We all quietly make our way up to the front and he points our eyes in the direction of one single horse which seems to have spotted us at the same time we spotted him. The horse is a lot close than I expected we would be to any horses today, and now that we’ve been spotted, the researcher tells us it’s only a matter of time until we see the rest of the herd. These horses are rarely alone and always stay nearby the herd. Once the horses know we’re here, it becomes a waiting game. We aren’t allowed to approach the horses (nor would we want to), and we want to be able to view them up close for as long as possible before they finally spook and run off. The plan is that once they run off, we’ll take a different route around the mountain in order to view the horses again from a distance. After about 15 minutes, we hear a rustle in another direction and now we have horses in three different directions. It starts to feel a little intimidating to be nearly surrounded by these wild animals who are about 10x my size, but also really exhilarating and exciting. Moments later the horses are finally spooked for good and stampede begins! 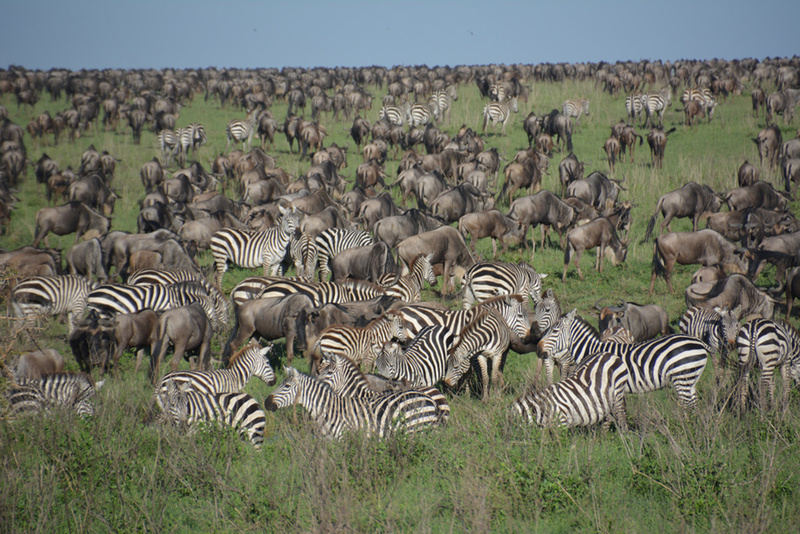 The closest thing I’ve seen to a stampede would be seeing the migration of wildebeests and zebras in Tanzania’s Serengeti, but wildebeests never seemed to be moving very fast. I’ve never seen a group of animals move so quickly all at once, and it really is a spectacular sight. I’ll be posting my highlight video of the Patagonia trip later this week and it will have some of the footage from the stampede in it. We’ve really lucked out on our location for viewing the stampede. We are nearly at the top of a hill and the horses have run away from us, down the hill and all the way up to the next hill across the valley. This has allowed our group to watch the stampede for much longer than we would have been able to if the horses had run the other direction. Once the horses reach the other side, they seem to find a sense of calm and lack of danger and once again settle in to graze. The horses have stopped on the nearby hillside to graze and our guides have found the perfect spot across the lake for us to eat lunch and rest with a great view of the herd. The horses seem to be so peaceful here. It definitely helps that they graze on either private land or protected land, meaning their habitat is not currently at risk of being lost. In other parts of the world, feral horses are seen as a nuisance or have problems with lack of grazing land and over-population. Not here in Patagonia. These horses have found and carved out their own little corner of paradise, with their only worry in life the constant possibly that they may one day be eaten by a puma. 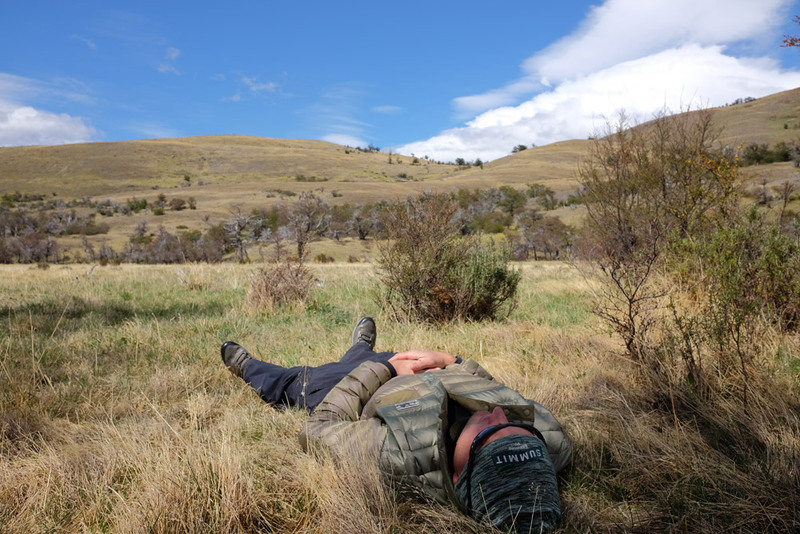 The break also was the perfect amount of time and location for a quick nap! It’s finally time to head back to the puesto. One of the things I like about this trek is that we are taking a different path home than the one we took out to the lake. I always prefer treks that go in a full circle instead of the down and back type treks. 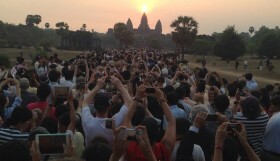 It allows us to see more and experience more views and wildlife. I really enjoyed this horse trek, as it is hard to imagine seeing horses in a more beautiful natural setting than this. 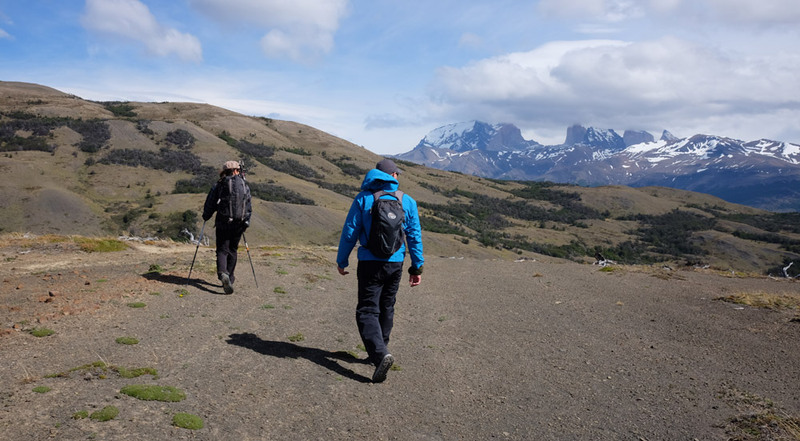 It was also a great introduction to trekking here in Patagonia, and we now feel much more ready and prepared for tomorrow’s big trek to the base of the towers in Torres del Paine!